Vantage Pro2™ offers the professional weather observer and the serious weather enthusiast rugged performance and a wide range of options and sensors. You'll get your own local forecast, highs and lows, totals or averages, and graphs for virtually all weather variables over the past 24 days, months or years - all without using a PC. Vantage Pro2 uses frequency-hopping spread spectrum radio to transmit and receive data up to 1,000 feet (300 m) line-of-sight. 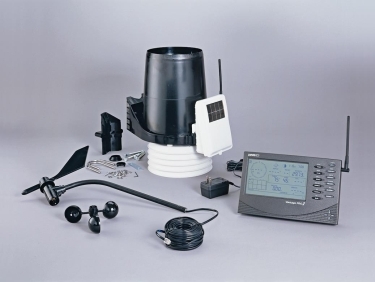 Vantage Pro2 is also an excellent choice for emergency professionals, farmers, schools, researchers, municipalities, and others to monitor wind and moisture conditions, irrigation requirements, and potential flooding. It can be customized with a range of add-on options, such as solar and UV radiation sensors, soil moisture stations, and long and short-range repeaters. CURRENT & HISTORICAL DATAVIEW - current data or highs and lows for up to 24 days, months, or years. FORECAST ICONS - let you know what to expect: sun, partly cloudy, rain, or snow. 12-hour icon forecast plus 24 - 48 hour ticker tape forecast at bottom of console screen. MOON PHASE - Track the eight phases of the moon. TIME & DATVIEW - the current time and date, time of sunrise/sunset, time and date of highs/lows, and time and date of a graphed data point. WIRELESS - Frequency-hopping, spread spectrum radio provides three times the transmission distance of the competition, improved reception through multiple walls, and greater immunity from rF interference. Main console can retransmit to additional consoles up to 1,000 ft. (300 m). BAROMETER - Five-position trend arrow shows whether barometric pressure is rising, falling, or steady. FIXED DISPLAY - Fixed display area shows the outside temperature, humidity and barometric pressure at all times. SOLAR RADIATION on - Vantage Pro2 Plus, view solar radiation, highs for the day, month, and year as well as evapotranspiration and Temp/Hum/sun/Wind (THsW) index. set alarms for high readings. UV on - Vantage Pro2 Plus, view current UV index, UV index for the day, the daily, monthly, and yearly highs; or change scale to see UV in current, hourly and daily MeDs. set alarm to warn of high UV dose/index. RAIN UMBRELLA - icon appears when it is currently raining. View last 24 storm totals with start and end dates. View daily, monthly, or yearly rainfall, and rain rate. STATUS ICON - Blinks to let you know that data packets are being received. CONTROL KEYS - Use arrow keys to scroll through data on graph or view highs and lows over time. Plus and minus keys simplify data toggling. TICKER TAPE DISPLAY - Provides expanded forecast details and additional information on current conditions. Displays more than 100 different messages! GRAPHS - Graph the last 24 hours, days, or months of readings or highs and lows. View over 80 graphs, including additional analyses of temperature, rain, rain rate, wind and barometric pressure.Vertical scale changes depending on what you are graphing. ALARMS - set more than 70 alarms for multiple functions simultaneously. WIND - compass rose with 16 points shows current and dominant wind direction. inside compass rose, view wind direction to 1° resolution, or view wind speed.